The unprecedented explosion in the knowledge base of reproductive medicine has led to new approaches to the diagnosis and treatment of disease. 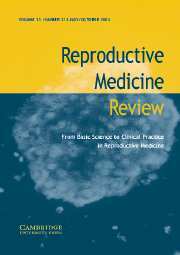 Reproductive Medicine Review publishes up-to-date reviews of reproductive medicine, particularly in relation to scientific discoveries underpinning developments in clinical practice. Coverage includes gynaecological endocrinology, infertility, andrology, assisted conception, embryology, genetics, nuclear transfer, reproductive surgery, menstrual disorders and the menopause. The journal is aimed at basic scientists and clinicians in the broad field of reproductive medicine.